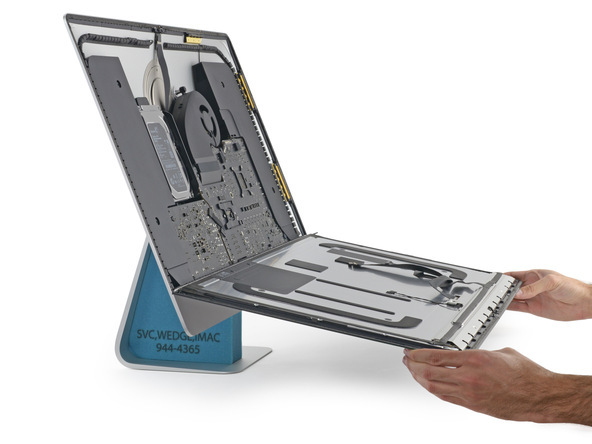 Though the new iMac with 5K Retina display was just released yesterday, iFixit has already acquired and disassembled one of the new machines, giving us a look at what's underneath the iMac's ultra thin display. Apple's newest iMac continues to use many of the same design elements from previous iMacs, including an easily accessible RAM upgrade slot on the back of the device. With the RAM slot, users will be able to install their own RAM modules with little trouble. The 5K display, which has a resolution of 5120 x 2880, was manufactured by LG Display, the same supply partner that has manufactured iMac displays for Apple in the past. 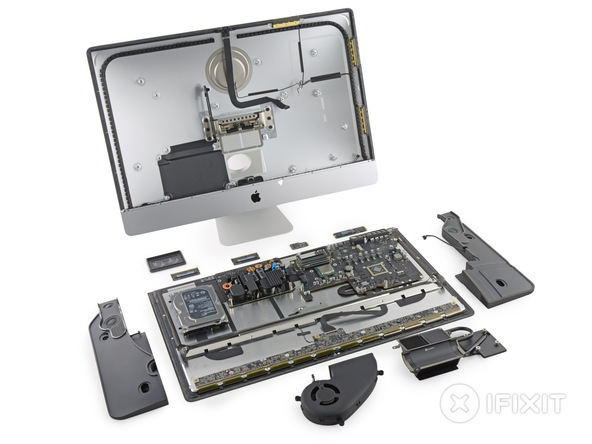 Aside from the display, iFixit found that the Retina iMac internals look much like the internals of the 2013 iMac, with the sole difference being a wider display data cable. The 27-inch iMac with Retina 5K display earned a repairability score of 5 out of 10, the same score earned by the 2013 27-inch iMac. iFixit pointed out that the RAM, hard drive, and CPU are user replaceable with some adhesive cutting, but removing the glass and LCD panel from the machine remains a difficult task for all those but the most dedicated do-it-yourselfers. As much as I wanted to pull the trigger and order one of these iMacs yesterday, this is the main reason I didnt get one right away. I am a first-gen MBPr owner who was  and still is  being burned by LGs burn-in prone display. App Store and some other windows were visible for only a couple of mins before I started the installer. You think the Vista-like frosted-glass effect in Yosemite is cool? Ive been living it for the past ~2.25 years. Best of luck to new iMac owners. I have a gen 1 retina macbook pro with LG display. Never had burn in. Stop Fudding. Also if true, you should have gotten it replaced. In this day and age of integration, iFixIt stands for a by gone era of rack mounded devices, mother and daughter cards, ZIF mounted chips, repairable transistors in those chips and above all, repairable pixels in displays. If they had their Luddite way, we would never have had powerful portable devices and only mainframes would exist. Yeah, us luddites actually wanting to be able to fix and repair things. And maybe even... upgrade? (ducks for incoming flames) How dare we!!! We need an iPad Air 2 teardown! And you didn't take it back to Apple? I had the same problem on my refurb 2012 rMBP after about 5 months. Took it to the Genius Bar and they replaced the display, at $0 cost to me. why isn't it called itearit? They always provide good details. Only the edge of the chin is thin. How did they fit all this stuff in 5mm-thick iMac? By making it an inch thick.